Due to its intermittent nature, solar energy cannot be fully utilized without a means of storage during sunny hours. One of the forms of storage of solar energy is to convert it into a solar fuel for use when required. Two types of solar fuels are now being considered-water-based (hydrogen), and carbon-based, e.g., methane. A carbon-based solar fuel would appear to be a self-contradictory concept. We are going solar because we want clean energy, and any carbon-based fuel would not be clean. Further, we already have large reservoirs in the bottom of Mother Earth. How would solar-generated gas be better than the naturally available gas? The answer to this objection lies in answers to the following two questions. How much total reserves of natural gas are available in the world? Are the supply sources and supply routes secure? The fact is, cost, energy security, and environmental considerations all matter, and that is why carbon-based fuels are an option. Carbon-based fuels have another merit compared to hydrogen as a solar fuel. Storage and transport facilities already exist for natural gas, and no modifications or additions to the utilization systems will be required. In contrast, hydrogen needs pressurized containers for storage and transportation, and fuel cells for utilization of hydrogen are still not commercial. Carbon based fuels will become more attractive if the carbon dioxide from flue of industrial establishments is captured as used as a feedstock. The idea of carbon capture is very attractive in that it will tend to reduce the greenhouse gas level. However, a lot of research is needed to do this economically. Although our industrial, commercial, and household energy consumption is adding carbon dioxide at a fast rate, the level is still not high enough to make extraction of carbon dioxide from air economical. However, many industries are already using or installing apparatus on their exhaust gases for carbon capture and storage (CSS). Carbon dioxide sequestration can be affected from flue gases using liquid solvents or solid absorbents. Among liquids, physical solvents like ethanol are preferable when the carbon dioxide concentration is high. When the concentration of CO2 is low, chemical solvents like monoethanolamine (MEA) are preferable. Currently this is practiced in the industry at a limited scale. There are multiple problems: high energy consumption of producing the solvent, cost of compression of captured CO2, and the fact that MEA degrades at low temperatures. 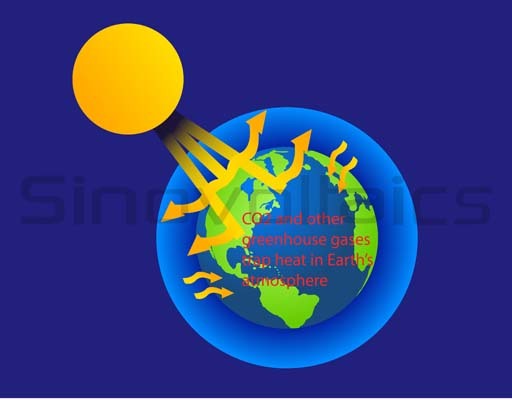 Carbon dioxide can theoretically be used to produce hydrocarbon fuels like syngas using a reverse water-gas-shift reaction (RWGS), solar produce hydrogen, and solar heat. Hydrogen and Carbon dioxide in the presence of catalysts and solar heat produce carbon monoxide and water. Carbon monoxide mixed with hydrogen then gives syngas which can be stored and used when required. Syngas can further be used for various purposes like producing methanol as a fuel, or liquid hydrocarbons using Fischer–Tropsch synthesis. photo-electrochemical, and thermochemical processes. These processes are similar to production of hydrogen from water, and suffer similar limitations, especially in terms of the materials used for catalysts, or for photoelectrodes. Carbon capture and conversion to fuel may be attractive in the near term, but will necessarily yield to hydrogen fuel in the long run, especially when then use of renewables eliminates the use of fossil fuels, leading to zero CO2 in the flue.